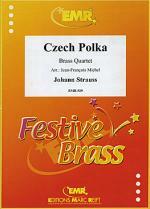 Czech Polka by Johann Strauss, Jr. (1825-1899). Brass Ensemble. For brass quartet. Swiss import. Grade 4. Score and parts. Published by Editions Marc Reift (MA.EMR-529). The Water Goblin, Op. 107/B. 195 by Antonin Dvorak (1841-1904). For 2+1, 2+1, 2 d1, 2 - 4, 2, 3, 1 (optional 2 nd tuba), timpani, percussion, strings. Czech Halloween: Romantic. Full score. Composed 1896. Duration 18 minutes. Published by Edwin F. Kalmus (KM.A1427-FSC).